Export taxes are the most commonly employed form of export restrictions on agricultural products, but they receive relatively little scrutiny in multilateral trade negotiations. This column demonstrates that taxes have a positive effect on prices, with effects generally detectable in the same year that the taxes are implemented. 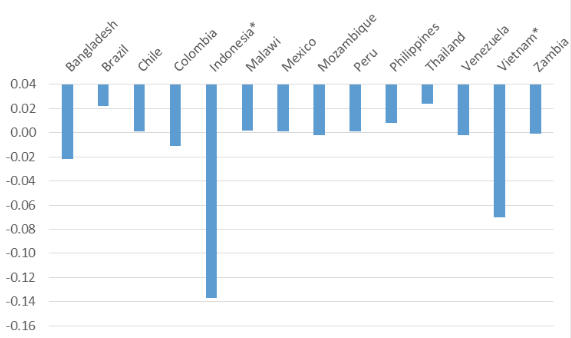 The removal of export taxes does not affect international prices, but can lead to small decreases in domestic poverty. Governments generally encourage exports as a source of national income and production, thus they are more likely to subsidise exports rather than to restrict them. However, export restrictions are frequently applied, especially on primary commodities, such as minerals, metals, and agricultural commodities (Piermartini 2004). In the agricultural sector, export restrictions are applied for a number of reasons, but in times of high or volatile prices, they are generally applied to guarantee domestic food supply and lower domestic prices (Anania 2014). 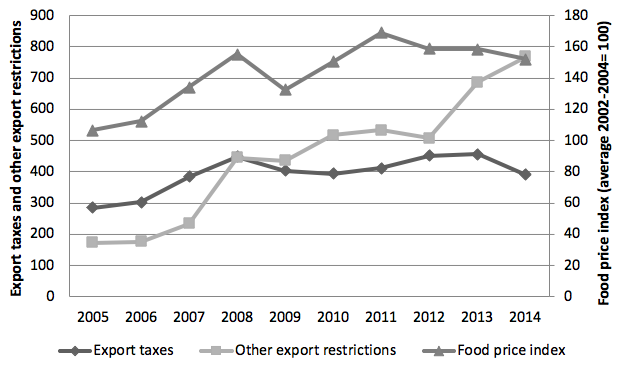 Between 2006 and 2008, in a context of high international food prices, export restrictions applied on agricultural products almost doubled, with export taxes being the most often employed measure1 (Estrades et al.2017). Export taxes have received less scrutiny in multilateral trade negotiations than other, more visible trade instruments such as tariffs, tariff-rate quotas, and export subsidies. This could in part be because they do not actually restrict domestic market access, but rather restrict the amount of products on the world market. In addition, several decades of low and stable prices, and the desire for market access, led to a focus on other trade instruments. The recent volatility in agricultural commodity prices during the 2006–08 and 2010–11 periods reignited the debate on the governments’ response to volatile and higher prices, and particularly on the imposition of export taxes. Given the potential effects of export taxes on global trade and welfare, efforts have been made in recent years to have a clear picture of the number and extent of export taxes. The recently developed database by Estrades et al. (2017), known as the Export Restrictions in Agriculture, indicates that export taxes were the most employed export restrictions from 2005–2014.2 As shown in Figure 1, there is a peak in the number of products affected by export taxes in 2008, and another peak in 2011. Export taxes were the most frequently applied measure in the period, although from 2009 on, the number of other export restrictions outnumbered export taxes. The figure also shows a global average for food prices. The food price index and the number of export taxes seem to move together, as the correlation coefficient is 0.86. 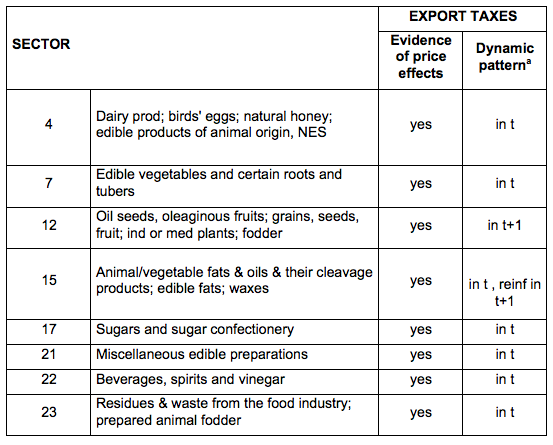 Source: Export Restrictions in Agriculture database. Estrades et al. (2017) show that, in the period 2004–2014, export taxes were mainly imposed for food security purposes. In a context of increasing food prices, export taxes are often applied in order to isolate domestic prices from the world market and thereby to prevent domestic prices from rising, or to ensure food availability. When a food-exporting country imposes export taxes, there is an excess of domestic supply, which lowers domestic prices. If the country imposing the measure is a large exporter of the good (i.e. it has market power in the global market), the measure is expected to have an impact on international prices, as export volumes fall. The increase in international prices could also take place when many small exporters apply such measures (Bouët and Laborde 2010). Globally, export taxes create distortions that have negative impacts on welfare; Laborde et al. (2013) find that removing all existing export taxes would lead to welfare gains of about $33 billion per year. The evidence on price insulating policies exacerbating commodity price volatility is not conclusive, but Gouel (2014) notes that countries that implemented these policies tended to weather the food price crisis the best. However, the countries mentioned in his work (China and India) are large agricultural producers with the ability to implement such policies; countries that are dependent on food imports were not as insulated. Demeke et al. (2008) examined short-term measures applied by 81 developing countries in the context of higher international prices (2007–2008). They found that 25 countries imposed export restrictions such as export taxes, which might have exacerbated the increase in international prices. We seek to contribute to the literature that estimates the impact of export taxes on agricultural international prices and trade (Beckman et al. 2018). To do so, we investigate this topic from two different angles. We first develop a partial equilibrium model that is based on the comprehensive and updated information of export taxes from Estrades et al. (2017). This model takes an ex-post approach to performing trade policy analysis, and is well-grounded in that empirical tradition. 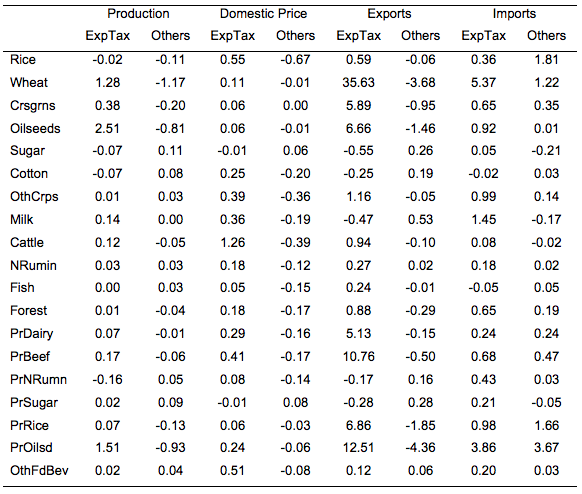 The dynamic gravity model used in our study provides evidence of an impact of export taxes on international prices of ten agricultural products, as Table 1 shows.3 In most sectors, we observe the expected sign effect – an increase in export taxes increases agricultural prices. Also, in most sectors the effect is perceived in the same year the measure is implemented (indicated in the table by the indicator ‘in t’).In those sectors in which we found an effect of export taxes, only a few countries applied measures in the period, suggesting that even without market power some countries did affect international prices with the application of export restrictions. Source: GMM estimations. aIn this column, ‘in t’ means the impacts occurred in the time period t that the tax is imposed; ‘in t + 1’ means the impact occurs in the next period; ‘reinf int t + 1’ means the impact occurs in t but is even higher in t + 1. We then take an ex ante approach using a global computable general equilibrium (CGE) model to consider the impacts of removing export taxes on domestic production, domestic prices, exports, imports, and poverty in 34 countries/regions. Because export taxes might impact the most vulnerable food consumers, we use a global CGE model capable of detailing the impacts to individual strata of income classes for several developing countries, known as GTAP-POV (Hertel et al. 2015). Our results, reported in Table 2, show that removing export taxes in place in 2008 would benefit certain countries with export taxes in place (ExpTax group) through the increase in exports of the affected sectors. However, it would hurt countries competing for these countries’ exports (the ‘Others’ group). The overall impact on global prices is not significant, and the impact on poverty is also slight, with some reduction of poverty in countries that had export taxes in place in the baseline (Figure 2). Note: The countries with an asterisk are those that had export taxes removed in the CGE scenario. Authors’ note: The findings and conclusions in this column have not been formally disseminated by the US Department of Agriculture and should not be construed to represent any agency determination or policy. Anania, G (2014), “Export restrictions and food security,” in R Melendez-Ortiz, C Bellmann, J Hepburn J (eds), Tackling agriculture in the post-Bali context, ICTSD, Geneva. Beckman, J, C Estrades, M Flores and A Aguiar (2018), “The impacts of export taxes on agricultural trade,” NBER, Working Paper 24894. Bouët, A and D Laborde (2010), “Economics of export taxation in a context of food crisis: A theoretical and CGE approach contribution,” IFPRI, Discussion Paper 00994. Demeke, M, G Pangrazio and M Maetz (2008), “Country responses to the food security crisis: Nature and preliminary implications of the policies pursued,” FAO Agricultural Policy Support Service. Estrades, C, M Flores and G Lezama (2017), “The role of export restrictions in agricultural trade,” IATRC, Commissioned Paper 20. Gouel, (2014), “Food price volatility and domestic stabilization policies in developing countries,” in Chavas, Hummels, Wright (eds), The Economics of Food Price Volatility, NBER. Hertel, T, M Verma, M Ivanic, E Magalhaes, C Ludena and A Rios (2015), “GTAP-POV: A framework for assessing the national poverty impacts of global economic and environmental policies,” GTAP, Technical Paper 31. Laborde, D, C Estrades and A Bouët (2013), “A global assessment of the economic effects of export taxes,” The World Economy 36(10): 1333–1354. Piermartini, R (2004), The Role of Export Taxes in the Field of Primary Commodities, World Trade Organization. Other export restrictions include export bans, export license requirements, and price references for exports. Other short term policies applied in the period were releasing food stock to the market, VAT reduction, and price controls. We do not find an effect on prices for the rest of the agricultural sectors not included in Table 1.